Open almost any magazine or fashion publication today and you'll be able to find the "right" clothes “for your body shape,” using various fruit and vegetable analogies to feign a level of politeness: are you a pear or an apple this time? This post basically is here to say that this is all just a bunch of B.S, and why we need to move past the conception of "flattering" clothes. Concession: as a thin and oh-so-slightly above average height (I’d like to think so) petite girl, I’m speaking from a place of privilege. Who am I to tell the rest of the fruits and vegetables of the world that they should embrace the bodies that the rest of society refuses to do? (Sure, I've experienced ostracization as a Muslim woman in the USA, but never because of my figure). So, I'd like to admit my privilege in this conversation and put it out there for you to consider while reading this. Alright. Still with me? You’re great. The conception that we should constantly be buying “flattering” clothes is based on a standardized idea of what beauty is—and, therefore, what it is not. The thin white girl with the curves in the right places and a waist you can put a keychain around still takes home the cake (but, of course, she just can’t eat it)—and flattering clothes are media’s conceptions of what can bring you closer to this ideal. Yeah, um, how about not. It seems we’ve (a “we” that is rooted in the patriarchy, btw…as is the oppression of women globally but just blamed on Islam…) become all too comfortable on giving women orders on how to dress and what to look like. In focusing all of our attention on outward appearances, of course it’s what is most important (aka character & intellect) that is often forgotten to cultivate. (All part of the patriarchy’s master plan, ladies). 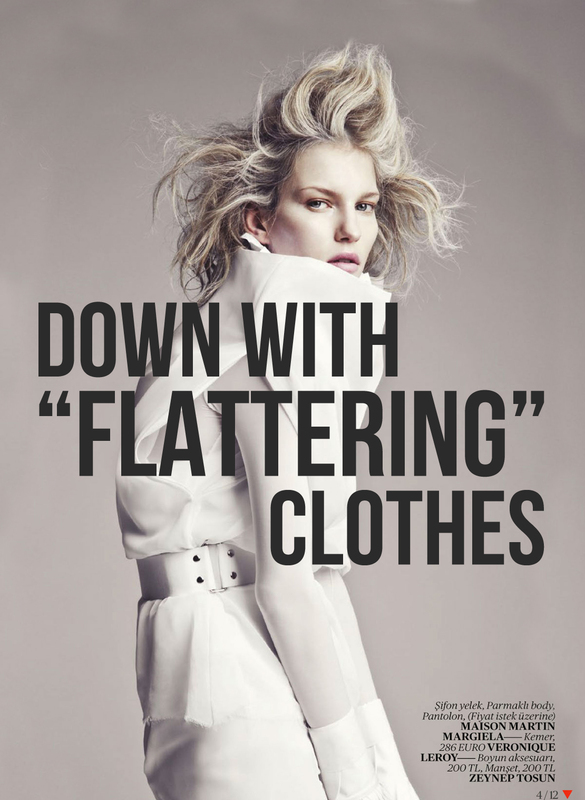 Using “flattering” as a rubric for dress, us women are pushed to squeeze our waists and pump our rear ends (or whatever the kids are doing these days) in order to perpetuate society's conception of ideal beauty--a conception that women must consistently strive for but will never reach. Certain jeans are off-limits to tomatoes or styles of dresses for carrots--all because it won't help you mold and hide parts of your body that are hindering you from reaching that golden bar of beauty. But reaching (and breaking) the glass ceiling is far more important, I think. Of course, definitely not insinuating here that we should all go out and run around in paper bags, or even to stop wearing things that "fit," but rather to reinterpret and redefine your style based on what makes you personally feel wonderful and confident so you can take on the world. (Like these wardrobe essentials). It's not what makes your waist 2 sizes smaller that is important than what lets you move past a society that encourages women to be obsessed with fitting rubrics. On JooJoo Azad we're also moving forward together on a minimal wardrobe project in order to lessen our attachment to, and dependence on, material goods (clothing) in general as a preoccupation of our lives. TL;DR: Screw society's standards of beauty. Wear whatever makes you personally happy and confident. Wear what defines you as a person, not hides you as an object. P.S. 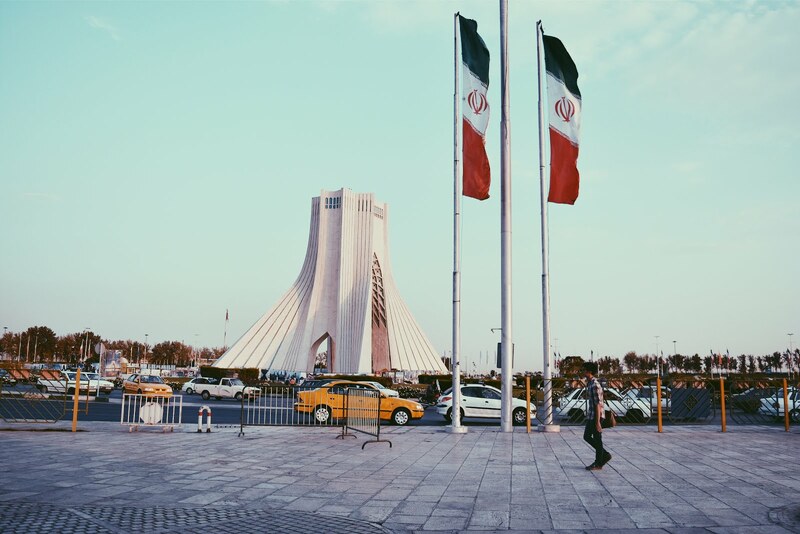 This post was inspired by me trying to be productive in a 12hr layover in Dusseldorf (…for a flight to Hamburg…even though I probably could have walked there in 12 hours…) and thinking about my upcoming research in Iran. If you’re also interested in women’s bodies as the center of politics (via fashion, of course), stick around because I’ll be sharing some findings on this space! P.P.S Not into words? Then follow along on Instagram or Snapchat (@hodakay)! Hmm... provocative. Love the idea of wearing whatever makes us feel good, but usually that coincides with what makes us look good. I also got tired of the idea that I should evaluate if my body is x or y so I could wear z. Haha I just wear what I want. Damn right girl! If I think I look good, that's all that matters. I wear stuff that is bad for my "shape" alllll the time. If it's comfy and makes you feel great, you need no other reason to wear it! True that. I went through a baggy thrifted pants phase and got a bit of flack for it initially, but then people start to realize that it can be empowering to just wear what you want. I'm always surprised that magazines are still regurgitating topics like these. Well put, I couldn't agree more! I find it so contradictory that more and more people and magazines speak out about supporting body acceptance and diversity (which is of course a great step forward), yet this nonsense is still considered the number one style rule. People should be able to feel awesome in whatever they choose to wear! Yes, this is so well written. As someone with a larger frame (it is not physically possible for me to reach that "ideal" size) who has been on a looooong journey of accepting the way I actually look, I have finally come around to the fact that dressing to hide my "flaws" does not have to be the be all and end all of my existence as a woman. Wonderful post. Aha, I was about to say "Well, it's easy for petite girls to say this, because everything looks good on them." Way to call yourself out on that haha! I hear where your heart is though, and I agree. These ridiculous standards in place are demeaning to women. Just because we're built differently and don't fit into an extremely narrow definition of physical beauty, it doesn't mean we can only wear certain clothes. Your arguments for comfortable, non-patriarchal clothing would be stronger without the stilettos. I agree to a certain extent. I was recently on one of my fav instagrammers blog, and she posted an outfit with info at the bottom being like, don't wear this stripey shirt unless you're thin, and that is just not okay. You can't say those things. You can realistically wear whatever you want. Love this all black look girl and the heals are stunning! I guess this post pretty much summarizes it all. And it is so true - beauty, uh, no. That's why I'm no big fan of those magazines who'll tell you what to wear and what you shouldn't, what you eat, how to do this and that.. I believe nobody is in charge to tell me what I should be like (or how to dress!). Although they always talk about it as "ideas" or "advice" I believe their opinion affects a lot of girls and women. Maybe they change their whole (life-)style because of a bloody article! And that isn't okay, this "brainwashing"-kind-of-thing, if I may call it like that. Great style girl! Love the photos! hello there! I honestly love how you wrote this post, love your point of view in this topic but I also think it's a hard concept to chew. Yes, we should wear something that make us feel beautiful and confident instead of trying to look how society wants us to look. But, at the same time that is the concept of "outside beauty" I guess, so wearing something that maybe makes you look thinner or hugging your shape in the right places makes you feel beautiful and confident. Anyways, I'm also looking in a more minimalistic wardrobe! so hard but so worth it :) I started the process a couple of months ago and still feel very far from where I want to be but on my way.